Whoo hoo - I'm on a roll, add another Christmas card done! I don't know about you, but I just can't seem to get the assembly line going when it comes to creating my holiday cards. I get too bored creating too many of the same card, thus mine are usually a hodge podge of different cards sent to everyone. To create this card, I used the new Poinsettia Ornament 2 from Heartfelt Creations along with the Petite Poinsettia set, to add some extra dimension to the Poinsettia already on the ornament. Both the ornament and Poinsettia are Gold embossing on Watercolor paper, then colored using the Marker Watercoloring Technique. The new Heirloom Ornament and Layered Poinsettia Dies from Spellbinders make creating these cards a breeze! 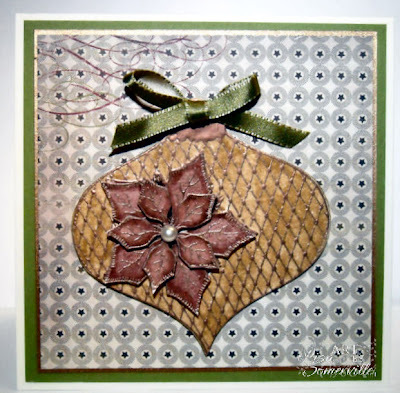 For more inspiration be sure to stop by the Heartfelt Creations Blog to see what the other designers created this week! Beautiful, beautiful, beautiful...anyone would love to get this stunning card for the holidays. Lisa..this is so pretty and how nice that those on your Christmas card list get hand made cards! Lovely vintage ornament. The poinsettia details are beautiful. What a gorgeous vintage card, love your colors! Lisa, this is a lovely project! You always make great cards, but this is exceptional!